It is now official as HP has announced their plans to release the HP ENVY 17 3D, a 3D-capable multimedia laptop for the holiday season this year. There were a lot of rumors going on about HP getting a 3D-capable laptop since quite a lot of time, at first for a professional solution, but now we actually get a quite powerful consumer laptop. And if we are lucky enough we may also see the HP 2310g 120Hz LCD monitor too, as apparently HP is finally ready to also jump on the 3D wave. It is interesting to note the fact that the HP ENVY 17 3D is actually the first 17-inch notebook to support 1080p 3D, meaning Full HD 120Hz screen for gaming and Blu-ray 3D movie playback apparently. But more interesting is the fact that the laptop is based on an ATI Mobility Radeon HD 5850 graphics card and that means no Nvidia 3D Vision, but an alternative solution also based on active shutter glasses. So that can either be some HP solution developed on their own, or more likely the AMD/ATI stereoscopic 3D solution that we’ve been waiting to see for quite some time now. The powerful video card should be backed by a quad-core Intel Core i7 processor, so there should be no problems in using this laptop not only for watching multimedia content in 3D, but also playing games in stereo 3D mode. 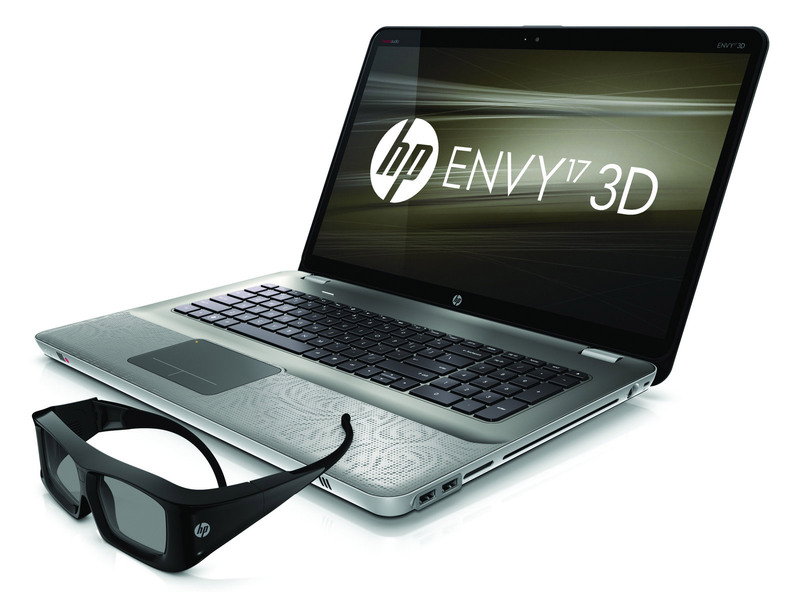 Also as a part of HP’s ongoing partnership with the National Basketball Association (NBA), select models of the HP ENVY 17 3D will include some 3D action from the 2010 NBA All-Star Game. Additionally a 3D movie trailer for the upcoming animated film “MEGAMIND” from DreamWorks Animation will be included, which is certainly Ok, but definitely we could use some more 3D video content. The HP ENVY 17 3D is expected to be available this holiday season with pricing yet to be determined, but considering that the currently available non-3D version of the HP ENVY 17 with similar parameters starts at $1,399.99 USD, the standard configuration of the 3D version of the laptop will most likely be in the range of $1600-$1800 USD. Full HD! Cool, I was waiting for the 1st to offer that, was thinking ASUS would be the 1st. Now let’s see the firsts reviews about the AMD solution since it’s new and undocumented. Finally a portable solution capable of doing OpenGL based 3D stereo… or what do you think? The glasses are XpanD developed meaning they will be high quality. I’m looking forward to more information and benchmarks especially considering they are the first to use the ATI 3D system. I’ve called and told the rep I’ll order it the second they are available. I’ve always been an ATI (AMD) guy. I’ve never liked NVidia for the wool they pull over consumers eyes: The GTS 350M is the exact same chip as the 250m is the exact same chip as the (i believe) 160.